The mission of the Limited Liability Company STANKOFINEXPO Ltd. is the development of manufacturing professional machines for electrochemical machining with the use of nanotechnology in Russia in compliance with the machine building international standards. Our specialists have been engaged in the development, production and maintenance of electrochemical machines since 1989. Great experience and practical skills ensure the solution of any question, related to this type of processing conducting materials. For the last years new models of modern high-precision broaching machines for electrochemical dimensional shaping with the method of electrochemical machining (electrochemical machining, electrochemical dimensional machining) were put into production. Since 2000 the STANKOFINEXPO Ltd. independently markets, implements into production, exports and provides the full range of maintenance services for electrochemical machines of various models. 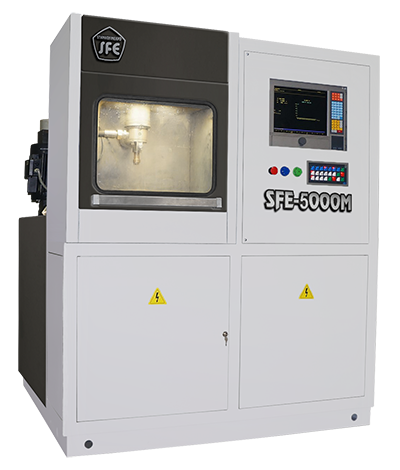 SFE electrochemical high-precision machines are widely applied in various areas of modern industry. Copying and broaching machines for electrochemical dimensional machining have no equals in international machine building and compete with the manufacturers’ equipment of widely spread methods of electrophysical high-precision machining in Russia and in the world. 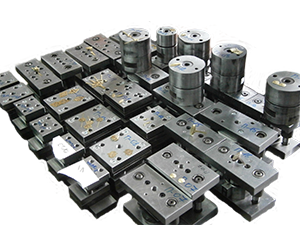 Die tooling, matrices, punches, press molding inserts, dies, stamps, marks, press-molds. Component parts for electrochemical machines, spare parts, units and devices for the delivered SFE-4000M, SFE-5000M and SFE-8000M machines. Spare parts for the machines out of production: electrochemical semi-automatic machine of OMA-1750 model, machine of SFE-4000M model, machine of ES-4000 model, machine of TEHO-8000 model, machine of ES-80, ES-100 models. Units and spare parts for ТP-130 (ТАP-130) machines. Development of technical and engineering documentation for manufacturing items with the help of the method of electrochemical broaching. Development and manufacturing of technological tooling for the customers of our electrochemical machines to be used in various industries. Designing and manufacturing matrices, dies, press molding inserts, engravings, marks, die tooling, press molds, punches. Plant major overhaul and modernization of electrochemical machines of ОМА -1750, ES-4000, ES-80, ES-100 models manufactured in 1989-2003 by the plants of Kirov city – Kirov Electric Machine Building Works LEPSE and Joint Stock Company ELECTROSYSTEMA in compliance with the new Technical Conditions, plant warranty is provided. Free training for personnel on the rules and methods of operating the delivered electrochemical machines. Warranty maintenance of electrochemical machines of all delivered models. Post-warranty maintenance of ES-4000 machines, ES-80 machines and PECM-8000 machines. Manufacturer’s plant warranty for ECM machines. Free warranty maintenance of electrochemical machines from 12 to 24 months. 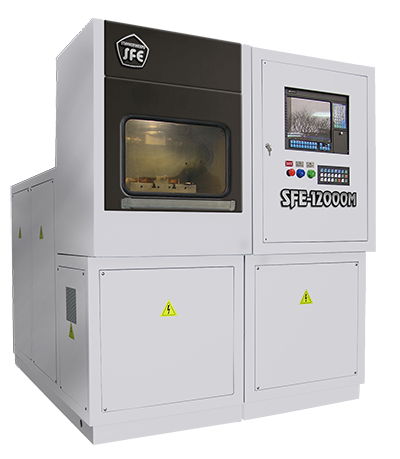 Post-warranty maintenance of SFE electrochemical machines for the whole life span (up to 20 years). Carrying out commissioning works for the delivered electrochemical machines. Free training for personnel on the rules and methods of operating any electrochemical machines. We purchase unused, used, preserved electrochemical semi-automated machines ОМА-1750 and ES-4000, manufactured by the plants of Kirov city – Electric Machine Building Works LEPSE and Joint Stock Company ELECTROSYSTEMA in any condition and with any component parts. 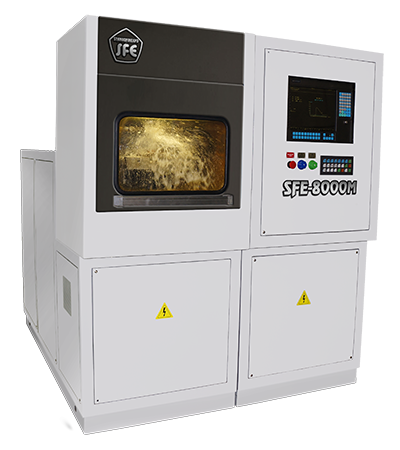 We trade-in new SFE-5000М, SFE-8000М, SFE-12000М electrochemical machines for the old ES-4000 and ОМА-1750 machines.